This past January, specialty chemicals company Albemarle gained control of Rockwood Lithium, one of the world’s major lithium producers. Last July, the world’s top lithium producers got a bit of a shakeup when specialty chemicals company Albemarle (NYSE:ALB) announced plans to acquire Rockwood Holdings (NYSE:ROC) for $6.2 billion. Included in the deal was, of course, Rockwood Lithium, one of the world’s major lithium producers along with Sociedad Quimica y Minera de Chile (NYSE:SQM) and FMC (NYSE:FMC). At the time, Bloomberg said that the transaction would be “the largest takeover of a diversified chemicals company since Solvay SA bought Rhodia SA in 2011.” Meanwhile, Chris Berry of the Disruptive Discoveries Journal said at the end of 2014 that he was surprised at the merger, and that he had expected more consolidation in the junior lithium space. Several months later, the acquisition closed for $5.7 billion; Albemarle has since said that its integration with Rockwood is progressing well. “We are very excited to integrate the Rockwood organization into Albemarle and see significant synergy opportunities to provide additional value to our shareholders,” Albemarle’s vice president of energy solutions, David Klanecky, told the Investing News Network. The integration is no small feat as Albemarle has nearly doubled in size since the Rockwood acquisition and now employs 6,900 people. Rockwood Lithium has operations in Chile in the Salar de Atacama, and in Nevada at its Silver Peak mine. Albemarle has also gained a stake in the Greenbushes mine in Australia, since Rockwood had a 49-percent interest in the company that owns the mine. China’s Chengdu Tianqi Industry Group owns the other 51 percent. Already, Albemarle has been reaping some sizeable rewards from the acquisition. In its first-quarter results, the company attributed a 47-percent increase in sales year-on-year to the inclusion of Rockwood. Net sales for the quarter came in at $884.4 million, compared to $599.8 million the year previous. Lithium only made up 15 percent of Albemarle’s core business revenue for the last financial year, but lithium sales were up 9 percent in Q2, and it looks like Albemarle’s interest in the lithium market is growing. Albemarle’s acquisition of Rockwood Lithium might speak to the company’s growing interest in the lithium market in itself, but the company has done a few other notable things in recent months that have affirmed its interest in the mineral. First, it’s relocating its corporate headquarters from Baton Rouge, Louisiana, to Charlotte, North Carolina. Rockwood Lithium’s Kings Mountain lithium facility is just 35 miles away from Charlotte, and Ken Elkins of the Charlotte Business Journal suggests that this proximity was likely a key factor in the move. Meanwhile, the company recently commissioned a new lithium carbonate plant in Chile, and in Australia, it’s adding 50,000 tonnes of mineral conversion production capacity so that it can significantly increase its battery-grade lithium production in response to growing demand. “Albemarle recognizes the significant energy storage movement globally and views this plan as the logical next step in our continued support of leading companies in the transportation, consumer devices and renewable energy industries,” said Albemarle President and CEO Luke Kissam in Tuesday’s release. “By expanding our production capabilities, we will be prepared to meet the growing market-driven demand for high-quality, battery grade lithium products as our customers in the global transportation and energy infrastructure industries innovate to utilize energy more efficiently and effectively,” he added. And, as mentioned above, lithium definitely doesn’t make up the majority of Albemarle’s revenues. It’s no doubt been interesting for critical metals investors to watch Albemarle since it gained control of Rockwood Lithium, and it’s certainly key for investors interested in the lithium market to keep an eye on the company. 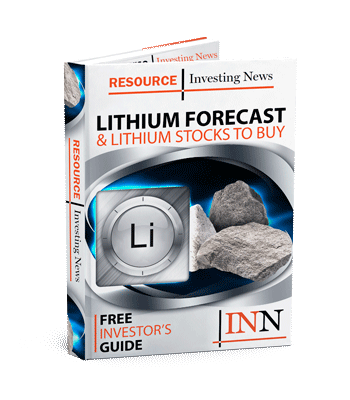 Still, post-Rockwood Lithium, it seems there’s another major producer with limited exposure to lithium, and investors who are truly interested in the mineral may need to look elsewhere. Securities Disclosure: I, Teresa Matich, hold no investment interest in any of the companies mentioned in this article.